blend, premium Shade Mix, Bent Grass or RTF Tall Fescue. 4 ft x 112.5 ft Roll. 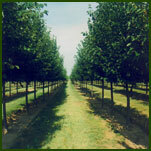 Shade & Ornamental Trees are available from our 120 acre nursery. Grown in their native soil. 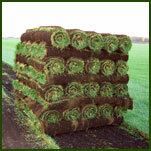 Rhizomatous Tall Fescue (RTF®) is an advanced generation of turf-type tall fescue which produces rhizomes. A rhizome is an underground stem that penetrates laterally through the soil to spread the plant. Rhizomes send shoots up to the soil surface while extending new roots downward, forming a new plant. 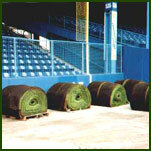 The rhizomatous nature of RTF is similar to Kentucky bluegrass. However, unlike Kentucky bluegrass RTF will survive the transition zone climate and other tall fescue turf regions. 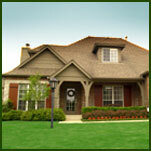 RTF is excellent for: Home lawns, Sports fields, Parks, Golf courses, and Commercial sites. Excellent in the transition zone climate and other tall fescue turf regions. Will not brown out in the intense summer heat. Early spring green-up. Withstands stressful hot temperatures and keeps its rich green color. Endophyte enhanced for improved insect, disease and drought tolerance. Environmentally friendly, reduces chemical and fertilizer inputs. RTF® sod requires less overseeding, has fewer weed problems and prevents “wide-leafed ugly clumps” of tall fescue plants which are common in other tall fescue turf.